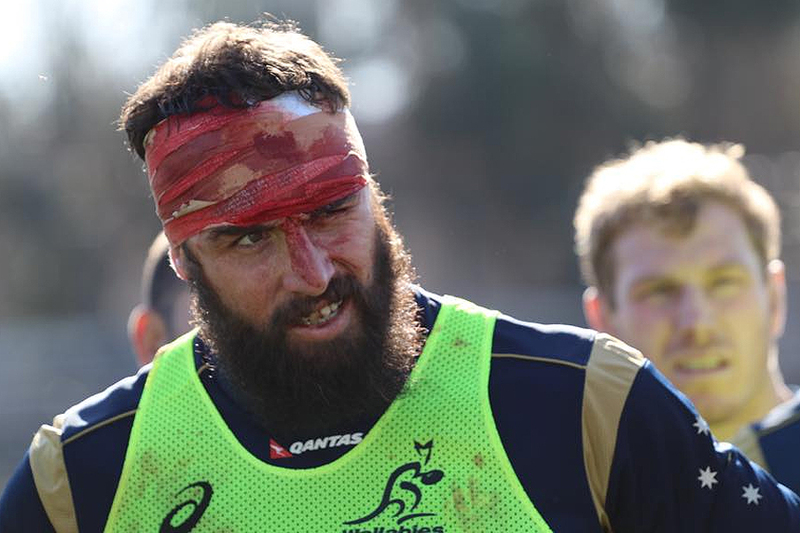 Wallabies workhorse Scott Fardy concedes he doesn't have the glamour factor of fellow flankers David Pocock and Michael Hooper, but he's happy to stay under the radar and keep his remarkable starting run going. The topic of whether Wallabies coach Michael Cheika would start the two opensides Pocock and Hooper together was a major theme though Australia's successful Rugby Championship campaign. Cheika alternated Hooper and Pocock for the first two matches before playing them together for the third. While they hogged the headlines, blindside flanker Fardy was the only back-rower to start all four Tests. "I'm probably very surprised there, especially with the quality of back-rower we've got," Fardy told AAP on Monday. One could argue he shouldn't have been given his extraordinary sequence of starts in the gold jersey. In an era when coaches have the luxury of naming six forward reserves, 31-year-old Fardy hasn't commenced a game on the bench since his first Test. He has started in his last 23 Tests, a longer streak than any other current Wallabies forward. "I'm not much of an impact player (off the bench), it looks like at the moment," Fardy joked. "I love wearing the six jersey, so I'm pretty happy." He doesn't begrudge the two opensides the heap of attention they receive. "They have got much more glamorous roles than I do and I understand that," Fardy said. "What I do is important for the team. They are obviously the topic of discussion a lot of the time but it doesn't bother me a lot. I do enjoy slipping under the radar." Playing at this year's World Cup wasn't on his radar at the time of the last tournament in 2011, when the late blooming back-rower had yet to make his Super Rugby debut for the Brumbies. "I initially just wanted to play Super Rugby," Fardy said. "When you get the opportunities then your goals change, but I probably wasn't thinking this far ahead." He felt the Wallabies forwards had generally performed well so far this season despite the heavy defeat in their last match to New Zealand in Auckland. "We've won three of the four Tests and it starts up front, so the forwards have been really good over the Rugby Championship, but we look forward to improving as we go into the World Cup," he said. Reflecting on the lessons learnt in their last start thrashing by the All Blacks Fardy said "we made a couple of crucial errors and they punished us in quick succession and the game was pretty much out of our hands. "They are an incredibly clinical side and we've got to be better than what we were there."